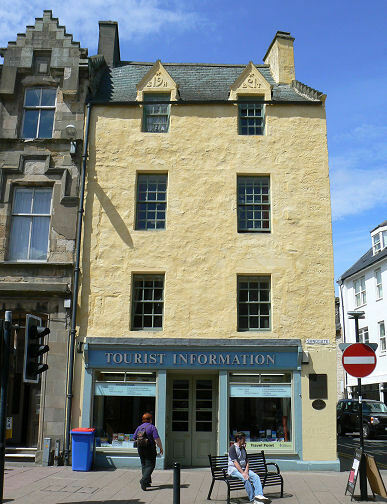 21st September 1756, Lady Cathcart’s House, Sandgate, Ayr, Ayrshire, Scotland. John Loudon Macadam’s family were originally descended from the chiefs of the Clan McGregor. His father was John McAdam and his mother Susanna Cochrane the niece of the 7th Earl of Dundonald. John Loudon was the youngest of ten children. Mr Doicks School at Maybole. 1760: The family moved to Lagwyne Castle near Carspairn. This was burnt down accidentally shortly afterwards and John Loudon was saved by a nurse. The family moved to Blairquhan Castle near Straiton. The present Blairquhan castle was built at a later date. 1770: His father James died and Loudon was sent off to the City of New York were he entered the counting house of his Uncle William who was a prosperous merchant. He also became the co-owner of the ship the “General Matthew” which was badly damaged by American forces at Charleston, South Carolina. He and his uncle also helped found the New York Stock exchange. During the War of American Independence he served in the British reserves and was a government contractor for the selling of prize ships. 1783: McAdam returned to Scotland with a considerable fortune despite the fact that many of his assets had been seized by the American Government. He was unpopular in America due to siding with the British during the recent war. He began to work with Admiral Keith Stewart in a factory which made coal products for sealing the hulls of sailing ships. Once copper was used to clad hulls the business declined and McAdam began experimenting in using tar for road building. He also became Deputy Lieutenant for Ayrshire a post which he held for fifteen years. 1787: McAdam was appointed as a road trustee. 1794: McAdam became a Major in a corps of artillery. 1798: He received an appointment at the beginning of the Napoleonic War as an agent for the revictualling of the Navy at the Western ports and he moved to Falmouth in Cornwall. 1801: McAdam became Surveyor to the Bristol Turnpike Trustees. 1818: By now McAdam was surveyor to thirty four road trusts. His three sons eventually moved form Scotland to join him in his roads business. 1819: He was mentioned in a parliamentary committee for the high regard in which his work was held. 1823: By now he was surveyor to over seventy roads trusts. He held many patents on road building and many were built at his own expense or by members of his extended family. As his patents proved so important to the country they were not protected by the government and Macadamised roads became a general term. Today the term TarMac is still used as a contraction of his process. 1827: Appointed Surveyor General of Metropolitan Roads in Great Britain but he never received any royalties from the government. He turned down a Knighthood due to his age and passed the honour on to his son John. 1823: “Parliamentary Enquiry into Road Making”. To Gloriana Nicoll, daughter of William Nicoll of Suffolk, New York. To Charlotte, the Sister of the Bishop of Lancy. 26th November 1836, Moffat, Dumfrieshire, Scotland. 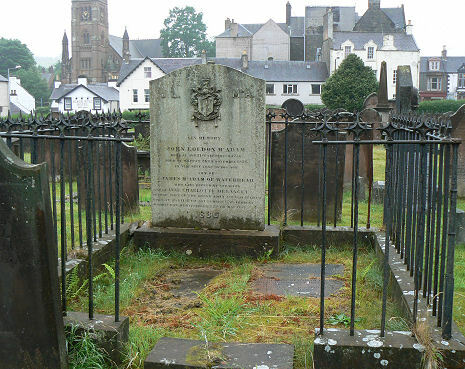 Moffat Cemetery, Dumfries and Galloway, Scotland next to his grandmother. Birthplace in Ayr commemorated with a plaque.